Desiree https://dishingwithdes.wordpress.com Married, mom to two sweet puppies, love to cook, read, and watch movies. Located in Missoula, MT. Addicted to coffee, wine, music & my family. Hello friends, family & fans! Thank you all for being such faithful and wonderful readers. I know I’ve been slacking, but it’s time to get things going again! Updated “Favorite Recipes” & more! So I know I haven’t been the best about using the other pages on my blog, but I’m trying to change that… so I just updated my “Favorite Recipes” page at the top! Check it out – I added my favorite beef stroganoff recipe, as well as my mom’s DELISH potato soup recipe! Matt will be out of town a LOT for the next 3 weeks, so I plan on going crazy with the new recipes, especially desserts (watch out, coworkers)! I have seen a lot of great recipes on Pinterest lately, so I want to make some of them soon!! Well hello everyone! I hope you all had a fantastic Thanksgiving/Christmas/Hanukkah/New Years/Valentine’s Day! Before we get to the business at hand – food!! – the blog stats were absolutely INSANE today, like biggest day ever insane! I have no idea why or how, but it’s awesome! Some of it has been Pinterest, but almost 200 of the hits came from Facebook and my “Easy Weeknight Pasta” post… weird, but awesome! Alright, it’s been a while, so let’s get back into the swing of things shall we? When Matt and I moved to Phoenix, I discovered so many new restaurants! There are always the great local places, but I’m always a sucker for a good chain restaurant. I had always heard about Chipotle, but never tried it. Luckily (or unluckily? ), there was one about 2 blocks from our apartment. It was love at first taste! I always loved the burritos at El Diablo in Missoula because of their cilantro lime rice, so I was excited to have that burrito in a bowl (no more tortilla in my teeth!). The only problem with these burrito bowls… they were gigantic and so unbelievably unhealthy. Ok, fast forward to about a month ago… I’m browsing Pinterest, which I do quite often, and I see this recipe for crock-pot chicken that sounds very yummy! As I’m reading through it, the flavors remind me of Chipotle… and that’s when the lightbulb goes off! I could totally make this and make my own cilantro lime rice and have my own Chipotle at home and in the portions I want and the fat content I want! I was super jacked! Can you tell?! And what better day for something like this than Super Bowl Sunday?! 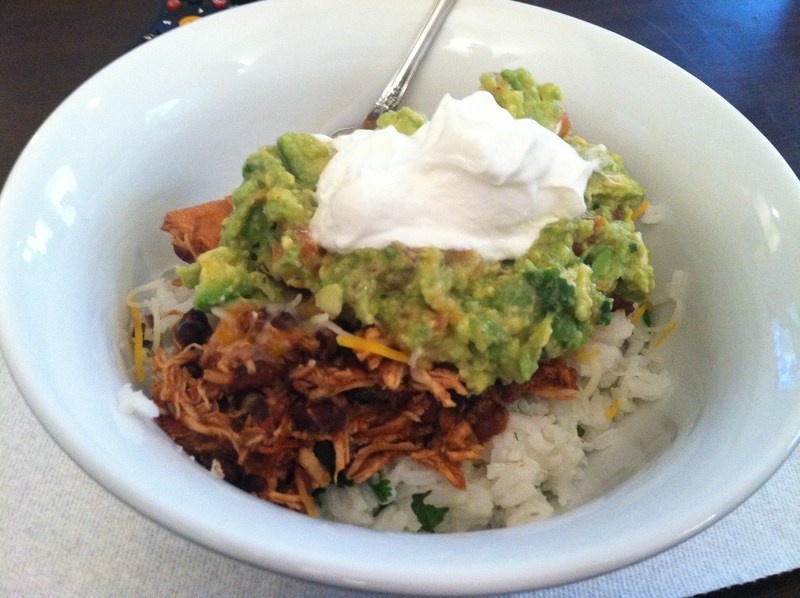 Football and crock pots go together like… oh forget it, let’s see it! While the now-shredded chicken is finishing its last cooking cycle, mix up the rice. Cook the rice as directed on the package (water/rice measurements may be different, plus I made the 4 servings ratio because I wanted leftovers for lunch). In a separate bowl, mix the lime juice, salt, cilantro, and olive oil together. Once the rice is done, stir it all together. Now it’s time to put it all together! First, put down a bed of the cilantro lime rice. Top that off with the chicken mixture, some shredded cheese of your choice, guacamole, pico de gallo, and sour cream, and there you have it! You can top it off with a little green leaf lettuce for a little crunch. Sidenote: I made my own guacamole using Tyler Florence’s Ultimate Guacamole recipe, which is seriously divine. In fact, now that I’m talking about it and looking at the recipe, I’m craving it….. yummmm! I hope you guys have fun recreating this recipe! You could totally do this with pork tenderloin or a beef roast too! Do your own thing – don’t be afraid to experiment with it!